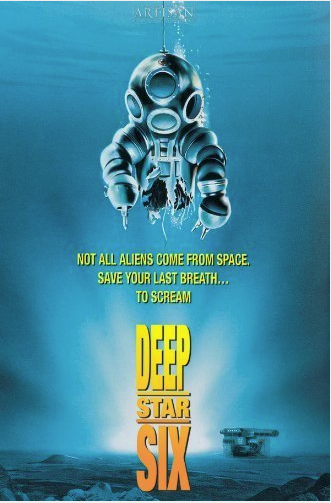 No, DeepStar Six, isn’t the latest Ultramarionation feature from Jamie Anderson, but a undersea horror movie from Sean Cunningham (Friday the 13th) that was followed in quick succession by George P. Cosmatos’ Leviathan, and culminated five months later in James Cameron’s far superior The Abyss. DeepStar Six revolves around a US Navy mission to place an undersea missile sled on the ocean floor; an action that only makes sense when you take into account that the United States was approaching the end of the Cold War with the Soviet Union. Dr. Van Gelder (Marius Weyers) is there to ensure that the missile platform is built before they leave the base, the time for which is rapidly approaching. Unfortunately, the project is behind schedule, so he’s doesn’t have time to putter about. The area where he choose to place the sled is suspected of having caverns underneath it, which Scarpelli (Nia Peoples) wants to take time to explore, though Dr. Gelder isn’t interested. Sure, properly surveying the area could have saved them quite a bit of trouble, but what specialist worth their salt let’s safety concerns trump completing a project on time. Which shouldn’t be a surprise considering one of their own crew, Snyder (Miguel Ferrer, who if James Spader was unavailable to play Ultron in the upcoming The Avengers: Age of Ultron, should have been on speed dial) is fraying at the seams and should have been evacuated to the surface weeks ago. And speaking of Ferrer, he’s easily the most convincing character in the entire movie which is why it’s such a pity that he so explosively loses it toward the end. Another awesome addition to the movie is someone whom you never see, but who’s presence is felt throughout the entire movie, and that’s the awesome score by Harry Manfredini (who’s theme for War Of The Worlds: The Second Invasion has to be one of the best television themes EVER. So, the explosives intended to clear the area instead caused a landslide, freeing photo-sensitive prehistoric monsters with murder on their minds, which is normally a good thing in a horror movie but not so much in the case of DeepStar Six because the monster that’s sinking submersibles is never actually seen. And I don’t mean the extended cocktease that was Gareth Evans’ Godzilla, I mean this monster is never once on screen. There’s a a lot to like about DeepStar Six, particularly the use of practical models for the subs but for a movie about a sea monster it’s unforgivable that you don’t see any till around 40 minutes in. The monster, or lack thereof, though isn’t the biggest problem. That would be that it isn’t necessarily a monster movie more than it is a ‘people coping with adversity in difficult surroundings’ movie, with a monster thrown in to make things interesting. Though if there were awards for accurate movie posters, DeepStar Six deserves it hands-down because what you see in the poster actually happened in the movie. DeepStar Six is currently on Netflix. Posted in actors, directors, FX, genre, horror, Movies, Netflix, practical effects, streaming, The Unnecessary Remake Dept..Tagged Friday the 13th, Gareth Evans, George P. Cosmatos, Godzilla, Harry Manfredini, horror movie, James Cameron, James Spader, Jamie Anderson, John Carpenter, Leviathan, Marius Weyers, Miguel Ferrer, Nia Peoples, Sean Cunningham, The Abyss, The Avengers: Age of Ultron, the Cold War, Ultramarionation, US Navy, War Of The Worlds: The Second Invasion. Next Post Can There Be A Overwatch Feature In Our Future?